Sweet and serene, but not without it’s darker, deeper moments. While the pacing and development of this novel was gentle on me, the heroine’s personal story of a privileged yet lonely childhood certainly tugged at my heart. She is locked within herself, with nobody to trust. After all, when your own mother turns her back on you, who can you believe in? Very good! And even though I was able to put it down and didn’t necessarily reach a fever pitch while reading, it was a solid read throughout. It’s about personal growth, attachments (and fear of them), triumphs and setbacks. But each step of the way was believable to me. Mind you a few times I was all… ARGH!!! Come on, you’re doing this to yourself!! STOP!!! But you know what? Forcing something before it is “ready” will only cause devastation later. So I can appreciate the tentative steps the characters took, and her own personal journey of self-awareness that lead her to where she is today. From an inexperienced child, to a manipulated and demoralized teen to a jaded adult. To… well, I’ll let you figure out the rest. Oh and did I mention this is a romance novel, too? While not traditional in it’s romantic intensity, it is a beautiful love story nonetheless. And what makes it that much more fun? Her love interest is an up and coming rock star. Local for now, but a BIG future ahead (and “Crank” was 100% believable – LOVED him!!!). Despite having a seemingly solid family, Julia’s world is anything but. Her father, an important diplomat has them traveling throughout the world over the years. Julia has been frequently uprooted, and despite her turbulent childhood she has been raised to keep up appearances. It’s amazing how you can say a lot of words that are all true, and completely obscure the truth at the same time. I was an expert at that. I spend my life spinning a web of half spoken truths; an armor weaved of words that do nothing but hide who I am. Julia’s teen years go awry as her very inexperienced young self is manipulated, and everyone she thought she could trust, turns on her in the worst of ways. Especially the one person that she should have been able to count on the most. As an adult, Julia has prevented herself from forming any close ties. Lesson learned, although she has taken it to the extreme, and her loneliness is palpable. To make a long story short: I’m twenty-two years old. I go to one of the top schools in America. In theory, I’ve got this fantastic life spread out before me. My family is comfortable, and I don’t have to worry about finances. But one thing I don’t have? I don’t have anyone to trust. Until she meets Crank. Despite Crank being her complete opposite (tattooed, hard-edged, pierced, foul-mouthed, and everything we love our rockers for), they develop a slow and somewhat uneasy friendship. Julia’s insists that she will never give her heart, trust or soul to anyone ever again, but she finds herself reluctantly liking him. His family. His world. … any fight between dad and me was going to turn into an explosion. Best to keep it all under the surface, simmering like always, but not let it boil over. … the love, care and respect that holds them together (even when it looks like they are falling apart) is irrefutable. Julia’s eyes are opened up to a whole new world. But Julia doesn’t make this easy for him. Or for her. An easy, lighter read (despite the darker undertones). I wasn’t throttled with extreme angst and dire circumstances, or heartbreak. It was all there, but… revealed at a slow enough pace that the book took on a more “realistic” feel. Now, if the author wants to go “there”, you know… angsty… there’s still plenty more of Crank’s future that we could explore. Their section of the series feels almost as if it could be a two or maybe even three parts. A rock star’s world can be quite a mess, what with the fame, exhaustive tour dates, close quarters, and groupies. Insecurities, impressions, doubts. All of that stress can certainly make for another interesting chapter in their story. “Because it’s fun,” I replied. Although, I’m not sure if that would “break” or cheapen the deeper feel of the series as a whole. While I love reading and experiencing the rock-star girlfriend’s elation and angst, these books have a personal growth and deep healing quality to them. While I was expecting (and maybe even hoping) to explore Crank’s BIG rock star world, I don’t think we were ready for that in this one. Yet. So that’s my take. It’s not just a romance, but a story about the love of family and friends and the healing energy that that kind of “togetherness” can provide. It’s about making your own family. And maybe even about healing and strengthening the bonds of a family that was once thought to be broken. 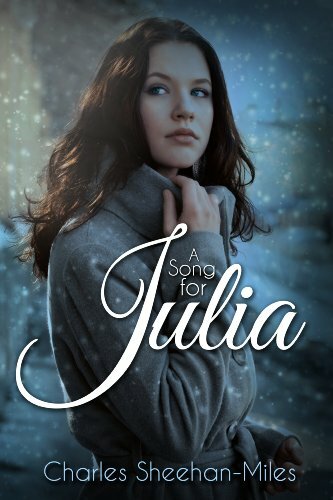 Book #1 in the series is Just Remember to Breathe however THIS book (A Song for Julia) is officially #1, if you ask me. It was written 2nd, but has been written in a way that you could (and probably should) read it first. I really enjoyed Just Remmeber to Breath! Looking forward to this book. Glad you reviewed this book. I usually don’t like male authors, but Charles does a great job. He could make this a 5 star read if he would up the heat and passion between his characters. I hope he does that for any future books. I agree with your review. Pretty much how I felt about it. Great review. I can’t wait to read this one. I loved both books! I just finished this one today. I agree that this should be book one and even wish I had read it first. ok so i have both books remember to breath & a song for Julia not read any yet but after reading your review am i lighting thinking i should read a song for Julia 1st? Lisa d, I would read a Song for Julia first. Remember to Breath occurs after A Song for Julia. HTH! I just finished Just Remember to Breathe. Now that you mention it. I should have waited and read this one first. I seems to me like all 5 daughters had some sort of relationship problems with their parents.